Tim and I just celebrated our fourth anniversary at the beginning of September. Here is a little insight to how Sarah and Tim became Sarah and Tim. You may be surprised. One August night in 2001, I was invited by a friend to go to www.ldschat.com with her, a chat room specifically for people of our faith. After a few minutes online, I started chatting with Tim. At the time I was living in Vancouver and he was in Portland. We soon found we were the same age, shared similar interests and got along quite well. We ended up chatting for four hours that night, exchanged email addresses and started emailing, chatting and racking up crazy phone bills on a regular basis. Because of the distance between us, we had the opportunity to develop a strong friendship that was an excellent foundation for what was to come. New Years 2002, Tim and his band came to party and we finally met. The chemistry was there and shortly thereafter, we began dating officially. We took turns coming to visit back and forth (luckily there is only a six hour drive between Vancouver and Portland) and then that summer Tim received his call to serve in the Chile Santiago North mission. I was devastated. Of course I wanted to support Tim but knew I was going to miss him while he was gone. Tim asked me not to wait for him, and I wasn’t planning on it. While I dated up a storm while Tim was away, the feelings I had for Tim (and vice versa) didn’t go away. That said, I had skipped out writing Tim for the last six months of his mission and Tim thought I’d gotten married by that point. At the end of his mission, we talked and were both a little indifferent of our relationship. He decided to come visit before leaving for school at BYU the fall of 2004 and before we knew it, we were exactly where we left off. Tim wanted me to come to Utah, to which I responded something like “over my dead body” (fate has a cruel sense of irony) and we decided to call it quits. We both thought it would be forever, but in February of 2005, I called Tim to tell him I still had feelings for him. He was dating another girl at the time, but before I knew it, he had broken up after mulling over our conversation. Tim told me that he had been comparing me to every girl he dated at BYU and none of them had measured up. By spring of 2005, Tim had planned a roadtrip with his school friends to Vancouver and we had several days together. At the time I was planning to serve a mission for our church and he was fully supportive of the idea. But by June, the thought of putting our relationship on hold for a mission was hard to swallow. We started talking about getting married and were engaged soon afterwards. How did Tim propose? We were at the Seattle Temple and he says to me, “Maybe we can go ring shopping this weekend!” and I’m thinking, “You don’t already have the ring?” As we”re sitting in the parking lot, then he pops this gorgeous diamond on me and asks me to marry him. I said yes, of course. One stressful summer engagement and two receptions later, we were married in the Cardston, Alberta temple and then rode off into the sunset. It was perfect. So there you have it. I met the love of my life on the internet. How is that for God bringing two compatible people together that may have never met otherwise? It’s beyond chance and makes me immensely grateful. How did you meet your husband/wife/partner? One of my favorite passions is flamenco dancing. Here is a phenomenal article by a gal I danced with in Vancouver, Lia Grainger, published in the National Post, a major Canadian newspaper. The first thing you will notice will be her eyes, black beneath furrowed brows, staring intently as she barks orders in Spanish. Next you will see her arms, lean and tan, cutting circles in the air with quick, fluid movements. Last will be her feet, pounding the grey mylar floor — ticka ticka ticka ta!–as she shouts without missing a beat, ” Hacer los pasos no es bailando -neccesitas sentirlo!” Doing the steps is not dancing — you must feel it. Ursula Lopez has travelled from Seville, Spain, to this basement studio in downtown Toronto, where for the next week she’ll be teaching a small group of Canadian women the art of flamenco. For the uninitiated, the word flamenco conjures images of flowing ruffled skirts, stomping feet, clicking castanets and the strum of a Spanish guitar. The art form does have its origins deep in Andalusia, and for those intent on learning to dance, sing or play flamenco, nothing compares with spending a month or two in a small Spanish town, hanging out in the caves of Granada or the bars and cafes of Jerez with the descendants of the Amaya or Farruco families, flamenco’s living legends. But for those who don’t have the time or money for an annual jaunt to the south of Spain, each summer, many of the Spanish flamenco masters travel to Canada to share their gifts with unlikely northern flamenco junkies like me. “It’s easy to become a flamenco junkie because you can’t get enough: You feel so good when you’re doing or watching it,” says Esmeralda Enrique, the director of the Esmeralda Enrique Academy of Spanish Dance where this one-week workshop with its Spanish guest teacher is taking place. I moved to Spain in search of that feeling. It had taken less than a year for flamenco to completely consume me. School, relationships and jobs all seemed bland and irrelevant when compared with the raw vitality of flamenco music and dancing. I dropped everything and bought a flight to Granada, where for six months I studied dance in a small, whitewashed cave buried in the hillside of the small city in southern Spain. In places the room was so small that I couldn’t raise my arms above my head. Each day for five hours 11 students and I would cram into the tiny, sweaty space and perform drills and choreographies as my teacher banged the 12-beat rhythm out with a long wooden cane, shouting unintelligibly in Spanish. It was heaven. And now, for this one week with Ms. Lopez, I feel like I’m back in that cave, with nothing to think about or know but flamenco. She begins the class, running through some simple arm exercises and making corrections to our individual technique. “Siempre delantero,” she says to me, reaching up to pull my raised arms forward. She moves into a footwork exercise and I am quickly breathless. “Levante los pieds!” Lift your feet. My calves are burning and the beads of sweat roll down my forehead and cheeks, collecting in droplets at the tip of my chin and nose. I shake them off and feel my wet ponytail slap against my neck as my feet continue to pound the floor in a steady, rolling rhythm. I glance up and Ms. Lopez is looking back at me, smiling. “La alta,” she says. The tall one. As a 6′ 1” ex-basketball player, I am an unlikely flamenco dancer: The best are generally small and compact. But seven years ago in a Vancouver restaurant called the Kino Cafe, I saw my first performance. The dancer’s name was Kasandra, and she silenced the boisterous audience with a choreography that left several jaws, including mine, on the floor. Kasandra pounded the shaking stage as though she wanted to break through it, a look of pure rage on her face, only to burst into an exuberant smile as she passed the fitful climax of the her performance. The emotional abandon I witnessed that night is an essential characteristic of flamenco, and something Ms. Lopez constantly halted our five-day workshop in Toronto to discuss. Though she meticulously led us through a carefully planned choreography, she always emphasized that the steps don’t matter; it is the feeling, the emotion of the performance that will connect the dancer with the musicians and the audience. “Los pasos no son importantes.” The steps are not important. Of course in the beginning the steps are important — a dancer needs to have at least a basic understanding of the movements before she can perform with any real force. It was during my first year that I learned about the basic elements of flamenco — song, guitar, dance and palmas (hand clapping) — and the essential interplay between these parts that creates that rare moment when everything harmonizes, a moment the Spanish call duende. I also observed a tightly woven and fiercely loyal community of women and men bound together by their love of the “arte” of flamenco. Many who go to Spain to study dance or guitar never come back. I did, and now that I’m here in Toronto, I depend on teachers like Ms. Enrique to bring the masters like Ursula Lopez to me. And Ms. Lopez depends on us, on the strength of small tight-knit communities like this one, full of women and men who covet her skills and passion enough to bring her halfway around the world to spend a week with them, dancing. It’s Christmas Eve and instead of being in roasting chestnuts on an open fire with the Wards in Vancouver, we are at a Howard Johnson hotel in Portland. Yep. Thanks to three feet of snow in Vancouver, we joined the ranks of troubled travelers as our connecting flight from Portland to Vancouver was canceled at the last minute, leaving us stranded in Portland on Christmas Eve. After reaming out the poor customer service agents at the counter, we explored our options. We opted with the first. Thankfully Air Canada was able to get us on a 6am flight to Vancouver first thing tomorrow. As we were on the phone working out the details for a hotel room, the thought crossed my mind – what if there aren’t any rooms for us to stay in? As frightening a thought as it was, immediately I thought of Mary and Joseph, finding no room in the inn and settling for the humble stable instead on that first Christmas night. We were not the first with frustrated travel agendas. This certainly put things into perspective for us. So whereever you are, Merry Christmas. We hope you made it home for the holidays. 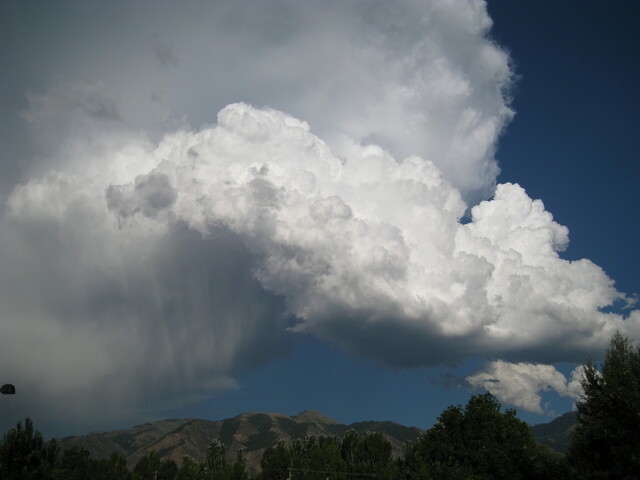 The last several days in Utah, there have been rain, storms, humidity and terrific bouts of thunder and lightning. I can’t help but feel nostalgic and reminiscent of our Vancouver home. I woke up in the middle of the night last week to the sound of rain outside our bedroom window. Such a beautiful sound! 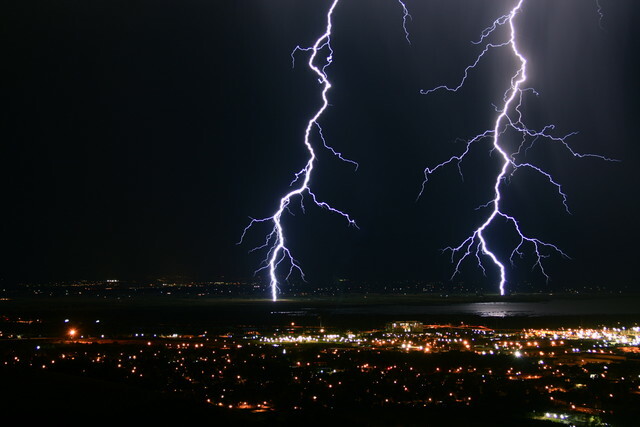 Utah Storm photos care of www.ksl.com. Inpsired by Cassandra Barney’s post, Now & Then. Quick question: what are your favorite little places to shop for clothes? Where do you go to get your hair dolled up for a special occasion? As you may know, our jewelry is at the Vie Maternity Boutique in Yaletown Vancouver and things have been going very well there – a big thank you to Henrietta for introducing us to Melissa and her lovely store. We’d love to get in touch with darling boutiques and hair salons about blue bijou. If you have a contact for us, too, it would be fabulous! Please feel free to email your suggestions to us to sarah@blue-bijou.com. As a token of our appreciation, we will send a $25 blue bijou gift certificate to anyone with a suggestion for us! 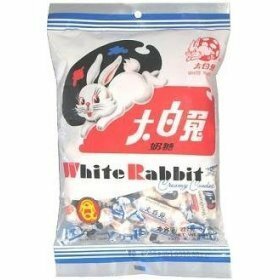 As kids, my mum used to get us these awesome White Rabbit Candies from the Fraser Street Chinatown district in Vancouver. If you’ve never had the pleasure, White Rabbit Candies are a “creamy, chewy, milk candy” according to Amazon.com (who actually SELLS them online! ), and can still be found in Asian markets everywhere. When our friend Diana came to visit us in Utah last spring, she brought a bag of these delectable treats for us from Vancouver. Tim and I both loved them, but someone we weren’t expecting to be a huge fan of them was kitten Ginger. Months ago, I happened to find a rabbit candy left over somehow and began to eat it. Ginger comes over and starts sniffing around and starts to lick the candy sitting on my tongue! The picture is rather disturbing, so I won’t post it. Tim just found another stray rabbit candy this morning. Of course, I opened it up and shared it with Ginger who eagerly began licking away at the milky candy. We wanted to share it with you… but the picture we took on Tim’s new Mac won’t load. 😦 Maybe next time. Just posted some of our lovely wedding photos on the blue bijou blog – check them out! 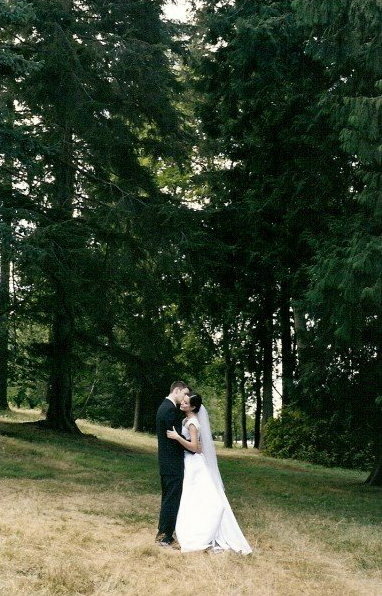 Beautiful photography care of Yaletown Wedding Gallery, taken at Queen Elizabeth Park in Vancouver, Canada. Oh the greenery… When watching Martian Child this past past week (HIGHLY recommend it! ), I knew it was filmed in Vancouver just by the lush greenery. You could feel the moisture in the soil and humidity in the air just by looking at it. That’s me – a true Vancouverite.